Most years, Jonathan and I have put up our Christmas tree on or around December 1st. This Christmas season has been different. I've been in California for four of the last six weeks. The first trip was for pleasure; the second was to celebrate the life of Jonathan's Grandpa Wilson, a wonderful man, who passed away a few days after Thanksgiving. Jonathan and I were fortunate to make it home for the memorial service. 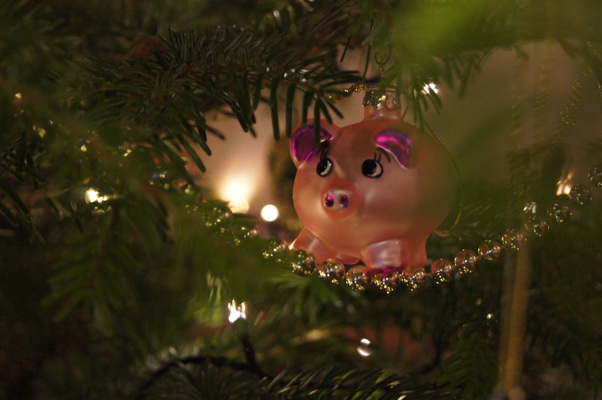 While we were in California, we helped decorate two Christmas trees, but it wasn't the same. 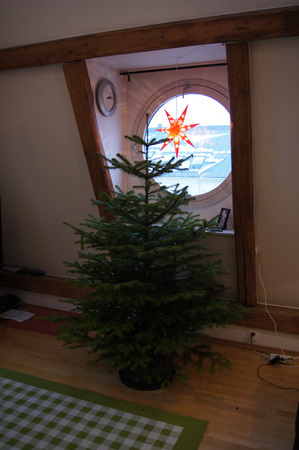 I couldn't wait to get back to our flat here in Oslo and make it all piney and glowy. Yesterday we walked a couple of blocks to the nearest tree seller. This one only opened on 14 December; last year, because we wanted our tree earlier, we took Trikk 13 out toward CC Vest (a mall) to get a tree. Riding on a tram with a tree was a new experience! We were happy to skip that ritual this year, though, as the season has been much colder and there's a LOT more ice on the ground. We spotted this year's tree right away! A little sparse, but beautifully proportioned. A nice, straight trunk. A rich shade of green. 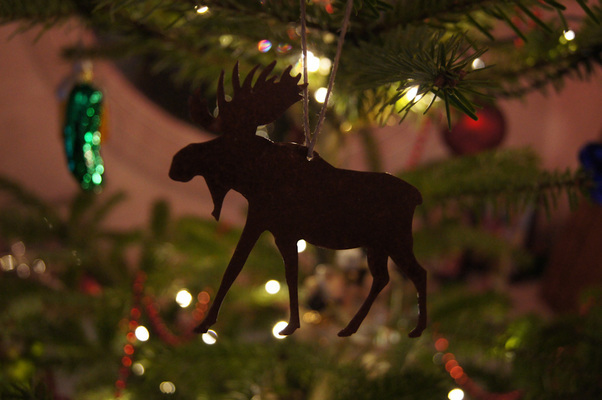 How much does a Christmas tree cost in Norway? Ours, just under 2 meters tall, cost 450 NOK ($80), including netting. We think they might be cheaper outside the city. My manly husband carried it home and hauled it up the four flights of stairs to our place. He set it up in the tree stand while I made cocoa. Then, with When Harry Met Sally on in the background (I don't know why I think of it as a Christmas movie, but I totally do! 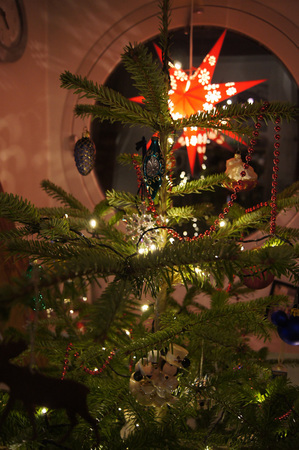 ), we began to decorate. 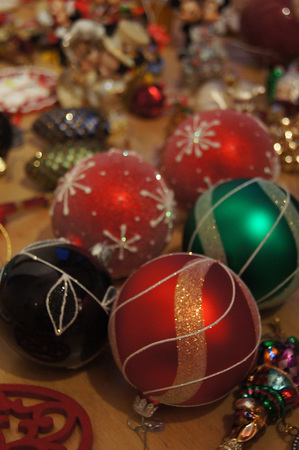 First lights, then garland, then ball ornaments, then the rest. In 2003, we put up our first tree together in my college apartment in Davis. We had to drive to Walmart to buy generic ornaments because we only had one or two personal ones. Things have certainly changed since then! We make a habit of buying a Christmas ornament on almost every trip we take together... just a momento, something to trigger a set of memories as we decorate our tree at the end of each year. Now we have so many, we actually had to leave a few in the box! Left: Sparkly Christmas balls on a table full of ornaments. 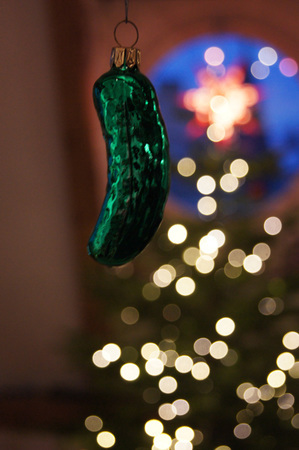 Right: Our Christmas Pickle ! Purchased at Disney World on our honeymoon in 2004. Moose! Or e lg , if you're Norwegian. We got this one at Grand Teton National Park in 2007. Left: The peasant girl ornament is from Cost Plus World Market in Pleasanton (they have the best ornaments! ), purchased in 2009 to commemorate Little Women: A Christmas Without Presents , a short skit I adapted from the 1933 movie version. Each member of our 6-person cast has one! I directed and acted in the drama, presented at the Ladies' Christmas Tea at our church that year. 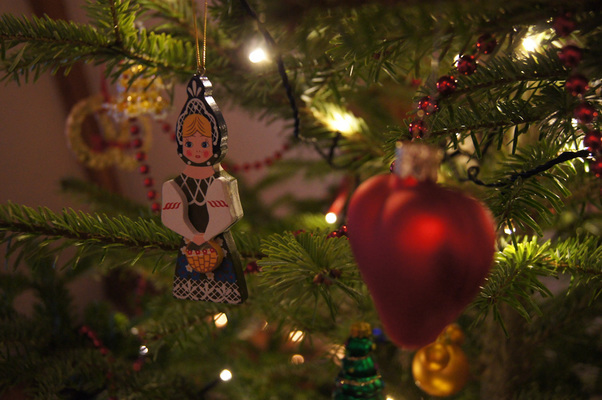 Right: The heart ornament in the foreground is from a little shop in Denmark, picked up in 2007. Left: We've received many beautiful ornaments as presents. This glass rabbit (in a jester's clothes!) was a gift from my mom-in-law. 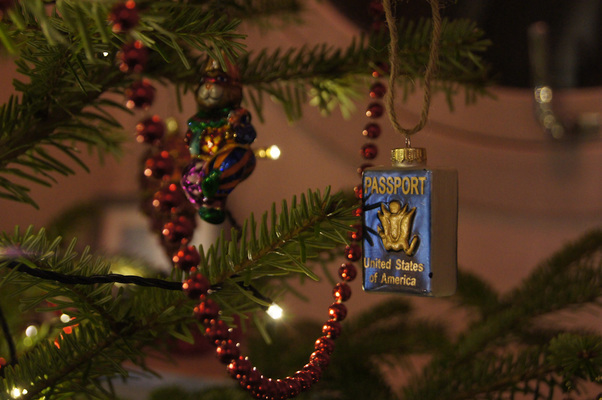 Right: One of Jonathan's advent gifts from me this year, a glass passport from Pottery Barn. Left: In August of 1628, the great Swedish warship Vasa sank on its maiden voyage out of Stockholm's harbor. It has since been retrieved from the bottom, restored, and is now on display at a pretty incredible museum in the Swedish capital. Jonathan and I visited (and picked up this ornament) on our 8th anniversary in 2011. 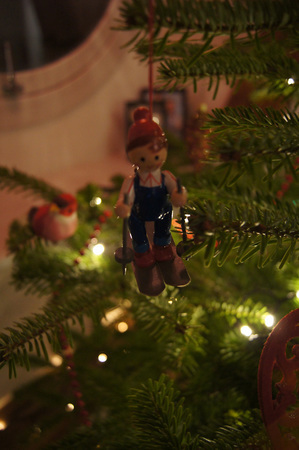 Right: An ornament from my childhood. Mom wrote on the bottom of the skis, AJ XMAS '85 . Little did I know that one day this would be an accurate representation of me! 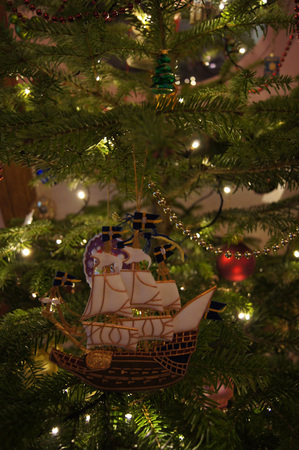 On our last trip to Copenhagen (in November), Jonathan and I each picked out a new ornament at a Christmas market. 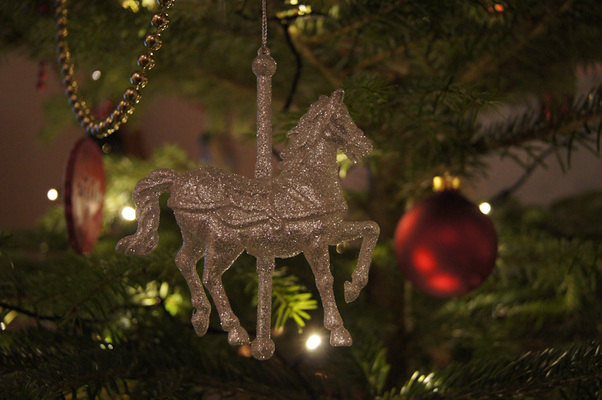 My choice was a sparkly carousel horse! Jonathan's was this adorable little pig. Naturally, we have lots of Disney ornaments. We've picked one up on every Christmas trip to the park. We did manage to squeeze a visit to the Happiest Place on Earth into our recent trip back to California, and our newest Disneyland ornament was just unpacked. 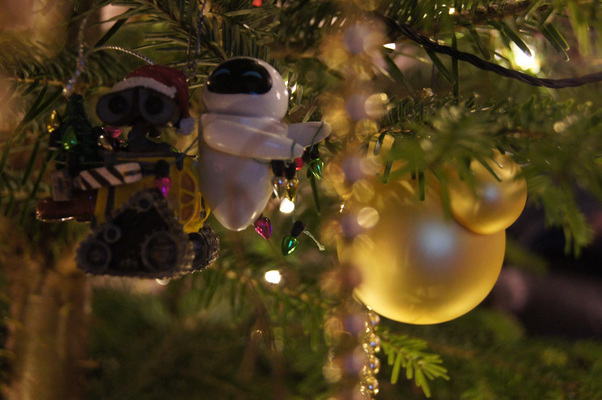 Wall-E and EVE tangled in Christmas lights. 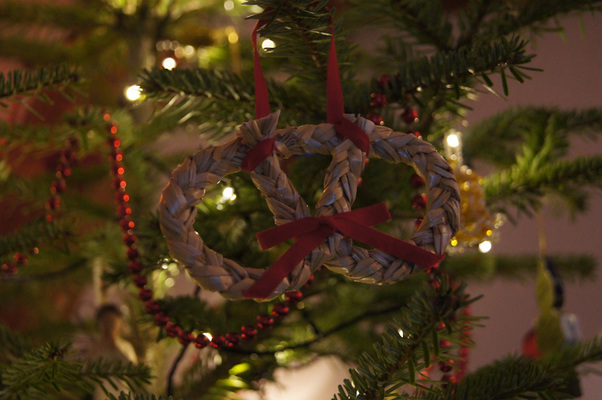 A day spent decorating a Christmas tree is a day spent well. We started at 2:15 p.m. on Sunday. The sun set less than an hour later! It's dark this time of year, but the Christmas tree shuns that darkness and makes our home reverberate with happy memories and hope. And, of course, we top it all off with our paper star.